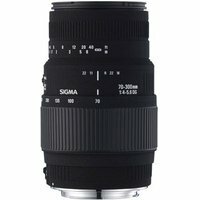 The Sigma fit 70-300mm telephoto zoom lenses has a tele-macro function and has been optimised for digital Sigma SLR cameras. The performance telephoto zoom lens is capable of shooting with a maximum magnification of 1:2 at the focal length of 300 mm. It's the ideal lens for portraits, sports photography, nature photography, and other types of photography that frequently use the telephoto range.